The theory of planetary tones or 'harmonical' concert pitches were developed and established under the name of 'Ur-töne' (archaic tones or sounds) by Prof. H.C. Joachim-Ernst Berendt, Journalist for Music. Based on the natural law , the equivalence of octaves, which means tones within a distance of the octave have an identical, partial row of tones, have the same overtones with the help of the 'octavation process'. It is possible to calculate an octave-analogue sound to every re-occurring vibration. He had invented for the Bead Game the basis of a new speech, namely a mixture of symbols and formulas in wich music and mathematicsnplayed an equal part, and in wich it was possible to combine astronomical and musical formulas under a common denominator. of an unknown Swiss music scholar and passionate mathematician, beheld through the 108 perls of the chain of harmony wich cause our solar-system to resonate. A few of these pearls are introduced and explained on the following pages. The concept of time gives rise to various associations in various people. Many people in the Western culture often have too little of it, and sometimes say: 'I don't have time' or ' I don't have enough time'. This shows clearly that time does not only refer to the dimension of experience but - in terms of algebra - to a certain amount of it. Most people mean a length of time when they say 'time'. The way time is experienced, is conditioned by our consciousness. For or the physicist, it is a basic dimension with a certain direction which is not reversable. For some sages of the East (Gurus, Yogis) time does not exist as such, but only as an antipole to that which cannot be experienced in terms of time. In many cultures this is called 'eternity'. The concept of time will not be used here in a strictly analytical, logical, physical sense, but as the duration of a period of time as it is experienced by most people. is not really an independant concept of its own, but a duration. Throughout history time has been defined as the period between two certain astronomical constellations (mostly of the same kind). The period of time from one sun's passage of the upper culmination (at midday) till the next is called a 'day'. The period from one commencement of spring till the next is called a year. Days and years are periodical phenomena, following one another in regular succession. Time is the period of oscillation of periodic phenomena. (Latin: frequentia) expresses the number of repetitions of a periodic phenomenon during a certain lenght of time (Vibrations/unit of time). Periodic phenomena (for example days, years, lunar cycles) are vibrations. The measuring unit of vibrations is stated in terms of time units. (This newspaper once had three editions a day, it appeared three times a day. A tuning fork vibrates at a rate of 272,2 vibrations per second, vibrating 272,2 times back and forth in one second.) One vibration per second is called 1 Hertz (1 Hz), (...) The number of a frequency, given in 'Hertz', is the number of oscillations during the period of one second. One second is the equivalent of the 86400th part of an average day. (Latin: octava, the eighth) is the eighth step in a diatonic sequence, which is given by the same letter as the initial note. According to the oldest Greek musical theory of Philolaos, the octave was first called 'Harmonia' and later 'Diapason'. The division of a string reveals the octave as the simplest proportion (1 : 2). 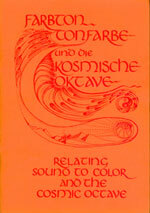 In terms of physics the first rising octave is the first overtone of a tonic and has double the frequency. The first descending octave of a tonic has half the frequency of the tonic. To form an octave is to double a frequency or to halve it. reads one of the mysterious inscriptions on the capitels at the abbey church of Cliny.